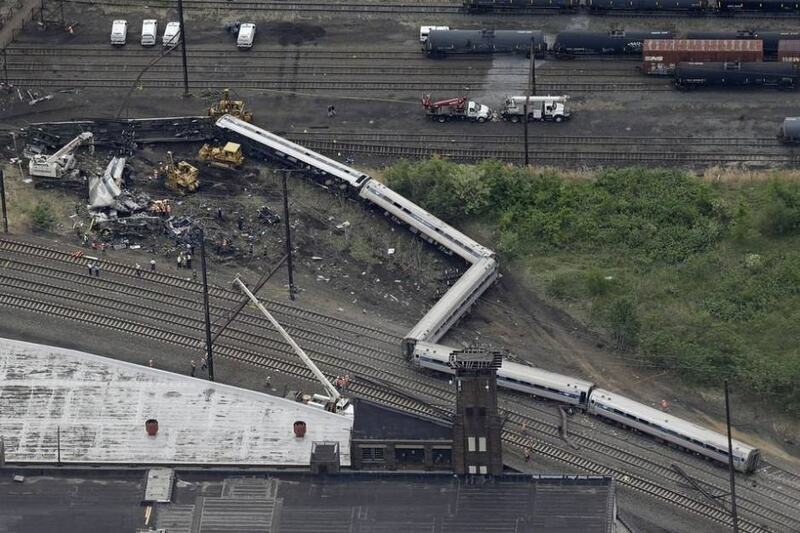 An Amtrak train that derailed in Philadelphia on Tuesday night, killing at least seven people, was traveling an estimated 106 mph before it crashed, officials said today. The speed limit in the section of track where the accident took place is 50 mph, according to the Federal Railroad Administration and the National Transportation Safety Board. The exact cause of the crash remains under investigation.According to NTSB board member Robert Sumwalt, at 9:21 p.m., the entire train derailed while going through a turn. Just moments before the derailment, the train was placed into engineer-induced braking. At the time the engineer applied the brakes, the train was traveling at an estimated 106 mph. Three seconds later, the train speed was recorded at an estimated 102 mph, Sumwalt said. The speed limit before the curve is 80 mph, Sumwalt added. It is unknown at what time the train reached 106 mph, Sumwalt said, but he added that the NTSB will be working on a timeline.